Here is President Obama’s FY2010 budget (pdf). The funding highlights for the State Department are in pages 87-89 including the following. Expands diplomatic and development Operations. This initiative will strengthen the U.S. Government’s diplomatic and development operations to support our national security. 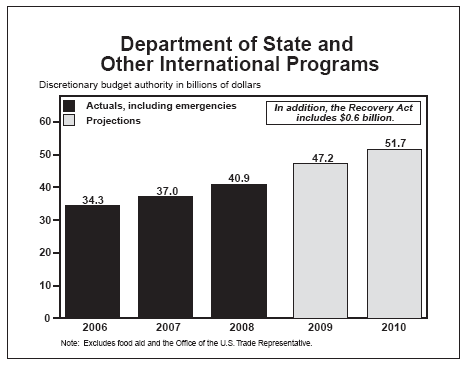 The 2010 Budget includes funding for the first year of a multi-year effort to significantly increase the size of the Foreign Service at both the Department of State and the U.S. Agency for International Development (USAID). An increased cadre of State and USAID Foreign Service officers will help advance our critical foreign policy goals and deliver on our expanding U.S. foreign assistance commitments. Reflects the Administration’s commitment to strengthen diplomatic and assistance tools to address current and future challenges that impact the security of the United States. Puts the United States on a path to double U.S. foreign assistance. This funding will help the world’s weakest states reduce poverty, combat global health threats, develop markets, govern peacefully, and expand democracy worldwide. Supports the worldwide operations of the Department of State and U.S. Agency for International Development, provides new resources to hire additional Foreign Service officers, and builds civilian capacity to meet the challenges of today’s world. Increases non-military aid to Afghanistan and Pakistan to revitalize economic development and confront the resurgence of the Taliban. Realigns U.S. assistance to Iraq to help responsibly end the war and enable Iraqis to assume more control of their country. Provides additional funding for key programs that advance U.S. foreign policy goals, including significantly increasing funding for energy initiatives, programs addressing global climate change, agriculture investments, and the Peace Corps. Provides full funding of all 2010 scheduled payments to the Multilateral Development Banks and a portion of the outstanding arrears to reinforce the U.S. commitment to play a leadership role in these institutions. Increases the U.S. quota subscription to the International Monetary Fund as part of the 2008 agreement on the Fund’s reform, which will promote a strong international economy and maintain the U.S. voting share at the International Monetary Fund. Meets U.S. financial commitments to the United Nations and other international organizations that support a wide range of U.S. national security, foreign policy, and economic goals. Supports United Nations peacekeeping activities that help restore and maintain peace around the world. Responds to global security threats by increasing counterterrorism and law enforcement aid to critical partner nations including those in the Western Hemisphere, as well as increasing funding for nonproliferation activities to secure nuclear material at vulnerable sites. Ensures that the United States continues to be the world’s leader in providing food aid and lifesustaining support for refugees and other conflict and disaster victims. Improves fiscal discipline and transparency by shifting funding for recurring programs, previously funded in supplemental appropriations, into the 2010 Budget. So at least 800 additional positions from FY09 and 100 additional Diplomatic Security positions from the Iraq supplemental. Remains to be seen how many more for FY2010 and beyond. Looks like hiring for Diplomatic Security jobs is now closed but click here for its 2009 Recruiting Schedule. Check out Careers@State here. Stabilization and Reconstruction jobs can be found here. And USAID jobs are posted here. Employees, acting in their private capacity, may establish personal blogs, wikis, or any other collaborative forum; however, the provisions of 3 FAM 4172.1-3 must be followed. Any posting to a wiki or blog that contains information “of official concern” to the Department must be cleared through PA (for domestic employees) or Chief of Mission (for employees serving abroad), unless being referenced from existing publicly available information. All public speaking, writing, or teaching materials on matters of official concern prepared in an employee’s private capacity must also be submitted for a reasonable period of review, not to exceed thirty days, to the office specified in 3 FAM 4172.1-3(C). In the case of time-sensitive materials of reasonably brief length, the period of review should be abbreviated in an effort to accommodate the interests of employees. But blog postings by their very nature are “time-sensitive” – short, and quick and shouldn’t have a long publishing lead time because they lose their “flavor” when you wait too long. Why blog about a diplomatic surge if it concluded months ago? The timeliness of the blog is what sets it apart from the other medium. It’s supposed to be a quick informal take… But wait – if you write about a diplomatic surge, wouldn’t that fall under the “official concern” umbrella, too? Not to blog, ever! Really! Ayayay! And State is growing the next crop of Public Diplomacy professionals? I’m a bit twisted in confusion here.